The European Union should consider setting up a European Space Force, EU commissioner Elzbieta Bienkowska said on Tuesday, January 22. "Several member states are considering just now ways to strengthen their defense doctrine to [the] space dimension. 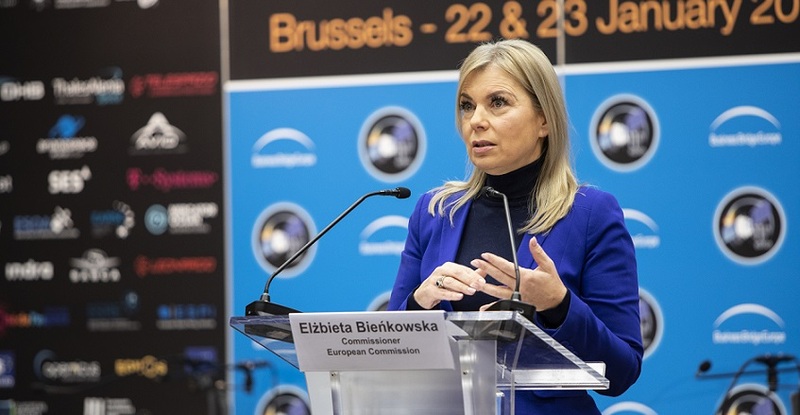 They are talking about space forces," said Bienkowska, responsible in the European Commission for internal market, industry, entrepreneurship and SMEs. Her portfolio also includes the EU's space policy. "The US is an important ally. (...) If your main partner is developing its space capabilities, its space policies in a direction, you have to take note of them when you are developing further your space defense programs," said Domecq. According to one EU source present at the conference - but speaking on condition of anonymity - space is already becoming weaponized, mainly by China. "The westernization is taking place, in a race between China and the US," the source said. The idea for an EU space force can be expected to face a lot of skepticism and criticism, since military affairs are still very much a domain national governments have control over. It was only recently that EU countries have decided to work more closely together on defense, for example by pooling resources and setting up a EU subsidies to make military companies work together across borders. The anonymous EU source also was skeptical of an EU space force. However, EU-funded space programs set up originally for civilian use, are expected to be used by European military forces. European Space Force is a interesting news. US president has announced they wanted that his country to set up a military branch in space. Same news I found on nexter. For latest updates keep visiting. Very informative stuff! Great effort you have done by publishing this post and this is defintely helpful for my friend Tony Daniloo. Thanks for sharing this informative stuff with readers.